Mobility and independence are essential to seniors who are looking to age in place comfortably. Lift chairs are a great tool to help the elderly maintain their freedom so they can live a high-quality life as they age. Lift chairs assist you in getting up and down, which is crucial because it allows you to control the chair yourself and get up without having to call for help every time. This is especially helpful for caregivers who can have peace of mind knowing that certain chairs are safer for the seniors they’re caring for. Some chairs even help promote blood flow and are programmable into positions that the user likes the most or are best for specific injuries and aches. In this article, we reviewed some of the best lift chairs on the market. Keep reading for more information. This is an excellent reclining lift chair that offers plenty of positions and easy to use controls. This chair offers functionality and comfort by providing plush upholstery and a proper lift that is high enough to make it easy for seniors to get in and out of the chair. The recliner requires minimal assembly since it is already mostly assembled when it arrives at your door, so you only have to attach a few small parts to finish the chair. The chair’s low physical effort requires in assembly and intuitive design make it a great choice for seniors who may not be able to perform fine motor skills easily. The chair is small, so it fits nicely into smaller rooms or areas where you would not be able to fit a large chair. The size also makes it easier to move around, if needed, and easier to get in and out of for smaller seniors. However, because of its size it may not be the best choice for tall seniors or those who wish to have more room getting in and out of the seat. 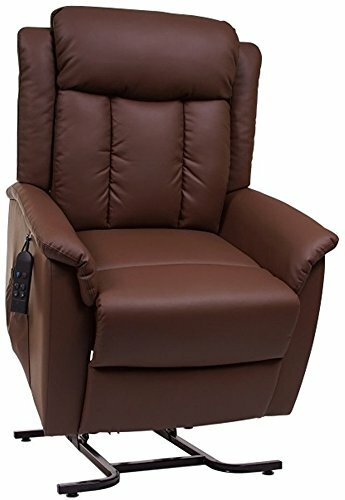 This chair is a good choice because it has a wall hugging design that pulls the bottom of the chair out during the recline. This saves space by allowing you to keep the chair right up against the wall. This is one of our favorite lift chairs for seniors. When aging in place, the best products will allow you to keep your home in its current state as much as possible, allowing you to save money, time and effort. With this two-position chair, its “wall hugging design” allows users to push it up against a wall, fitting in most spaces and small rooms without the need for modifications. For seniors who have limited dexterity and eye sight, this chair also comes with controls that are large enough to read and simple to use. To move the chair up and down, it only requires a push of a button and limited physical ability, which is an especially great feature for seniors who might have arthritis. Furthermore, the chair operates with a quiet motor and moves at a nice pace that isn’t too slow or too fast. As for comfort, the padding on this chair is sufficient. We felt that you could sit in this chair all day and feel pretty good. The padding on the armrests could be a little better, but the footrest is long and can accommodate people of all sizes. Overall, the cushioning is developed in a way that will help seniors feel more comfortable, especially if they might be suffering from aching joints or back pain. This 3 position chair comes in a variety of sizes and colors but the buttons on the controller are somewhat difficult to push. A three-position lift chair is ideal for seniors who may spend a lot of time getting in and out of the chair as well as relaxing, allowing them to set the chair to the most ideal position for their comfort at the time. This three-position lift chair from Pride Mobility is notable for the materials used to make it comfortable, durable and stylish. The material used is quite like memory foam, which is especially great for seniors who need more support for their back. The chair comes in four different colors and has a 19” deep seat, which can accommodate seniors of most sizes. This lift chair is also an affordable option, but still gives you all of the basics that you would want. It has a simple to use the control pad, but we did feel like the buttons were a bit difficult to push. This could be a problem for seniors with joint or bone discomfort, such as arthritis, or for those who aren’t able to perform fine motor skills. However, if a caregiver is on hand, they could quickly aid the user in adjusting the chair to an appropriate position. The main thing we like about this chair is the comfort. If you are looking for an affordable chair that is comfortable to spend a lot of time in, this is the right option for you. This heavy duty is a great option for people who feel they need a little more to a chair to feel comfortable. Within its heavy duty design there are also a bunch of different sizes to meet your needs. This is a heavy duty lift chair from Golden Technologies that is built to accommodate people of most heights, ranging from 5’0” to 6’8”. Everything on this chair is built for senior comfort, including the back, headrest, and footrest. Within the heavy-duty design, the chair also comes in three different sizes: medium, large, and tall. We’ll break down the dimensions of all three models below in our Features and Specifications section. With two heavy duty motors, you can be assured that this chair is built to last. For seniors aging in place, this is a great benefit to know that you can make one purchasing decision now that will last you for a long time to come in your own household. This chair is also built for safety by eliminating any space between the footrest and the end of the chair, as well as allowing for different sizes so that you can ensure you’re choosing the best option to get in and out of for your size. The biggest downside of this chair is that the assembly required is more involved than most other lift chairs, especially since it comes with two motors. Many seniors may not have the physical capability to put the chair together, although when purchasing the chair online there is the option to have someone set it up for you inside your home. This chair is great because it features a few different positions that elevate your feet above the rest of your body. This is great for people with heart and circulation issues. This chair is considered incredibly comfortable and has a variety of unique features that separate it from its competition. In terms of its control, the attached remote is programmable, so you can set the chair to a specific setting that you like and then program it so that you only have to hit one button to get back to that exact position again. This is ideal for seniors who know they’ll be spending a lot of time in the chair and don’t want to fuss with finding the perfect position every time. For caregivers, all you’d have to do is program the chair to the seniors’ needs and know that they can adjust the chair themselves with just a push of a button. The chair is available in a few different sizes ranging from petite to extra-large, which ensures comfort for seniors of all sizes. There is also plenty of padding on every inch of this chair, and even the small chairs have a weight capacity of 300 pounds to meet everyone’s needs. Like most heavy duty chairs, this model is also built with two motors to handle more weight, but that also means that the chair can last longer while you age in place. Something we found incredible is the fact that the chair offers a Trendelenburg position, which allows your legs to be elevated slightly above the rest of your body. This promotes proper blood flow to the head and heart, and can be beneficial for seniors with back problems or aching joints. This position, also known as zero gravity, removes a lot of stress from the common pressure points associated with sitting in a chair, and can help seniors relieve pain over time. If space is an issue for you in your home, then this chair is a great option. It’s a three-position lift chair that reclines without needing much space around it, so it does not need take up any extra space behind the chair. It can be fit up against a wall so you don’t need to worry about modifying anything about the room you may already be using as a sitting room. This chair also offers plenty of padding and comfort for the user. Something we noticed about this chair was the overall feel of the frame; there is no creaking or “giving way” of the chair when you sit down, and it feels very durable and long-lasting. This petite chair also comes in a few different sizes to meet everyone’s needs, and we’ve outlined the dimensions in our Features and Specifications section. This chair is a great option for more petite seniors under 5’3”, as it’s built with your measurements in mind. It can be very dangerous for seniors to settle into a chair that isn’t the right size for them, since it’s easy to hurt yourself trying to get out. The chair comes in a variety of sizes ranging from small to tall, so each person receives their customized chair to meet their needs. We chose this chair with taller seniors in mind primarily due to the extended backrest, superior lumbar support, and gapless footrest area. This provides additional support to the legs and lower backs of seniors who are over 6’0”. The chair also comes in a variety of sizes ranging from small to tall, so each person receives a customized chair to meet their specific needs. There is also a full-size chair with a 500 pound capacity that is built to accommodate comfortably and last a long time. The chair features a variety of positions and comes with the ability to program buttons, so it can remember your favorite positions for next time. Taller seniors tend to have more problems with their hips and backs, and this chair is tailored to meet those needs. Its zero gravity position will take pressure off your lower back, while you can also adjust the seat to raise your hips and release some of the tension that builds up throughout the day. With this chair you get a lift position, seated, reading, napping, relaxing, and sleeping position. You can also be sitting in a fully upright position while having your legs raised in the reading position. This chair from Golden Technologies was given the title best for transfers because of its unlimited positions and a wide range of motion. 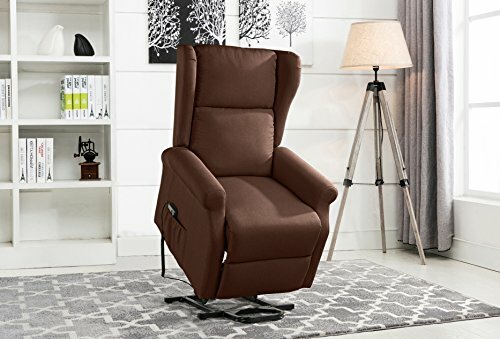 The angle of this chair when it is at full lift is higher than most, and there are a ton of different reclined and relaxed positions as well. With this chair you get a lift position, seated, reading, napping, relaxing, and sleeping position. You can also be sitting in a fully upright position while having your legs raised in the reading position. This will help elder seniors mitigate many of the aches and pains that come with everyday life, since many of the positions are designed to take pressure off of common aches. This chair is an especially good option for seniors who may be recovering from surgery or need to be on bed rest due to a medical condition. Laying or sitting for an extended period of time comes with its own host of problems, but the ability to alter your body position with this chair will help relieve much of these problems. As for comfort, there is plenty of padding in all directions. The only issue we could find is that there are no variations in size and shape so what you see is what you get. If you or a loved one are looking to get a lift chair you have a clear understanding of what you need and why you need. We want to be here to make sure you know exactly what you are looking for in a lift chair and some of the features you should pay attention to. Not everything is written clearly and easily for you to understand so we’re covering a few of the significant points and things you should look for when you go to purchase your lift chair. This is one of the most important factors you should pay attention to when browsing for lift chairs. How many positions does the chair offer to the user? Some chairs only provide two positions, which typically consist of reclined and straight. The standard position can be all you need, but there are a multitude of other positions that are beneficial for a variety of different concerns, such as back pain, swollen ankles, tight hips, and spinal discomfort. For example, some chairs offer multiple positions that allow you to sit entirely reclined, and there are also chairs that will enable you to sit upright while your leg rests are up. When you are deciding on a chair and how many positions you need also keep in mind that chairs with multiple positions typically come at a higher price. This is something to discuss with the user of the chair. If they feel that they need a chair that offers some versatility then look for one with many different positions so they can be as comfortable as possible. Something else you want to pay attention to when you are deciding on a lift chair is the comfort and durability of the chair. You want something that is nice and comfortable, but you do not want it to be so soft and plush that everything wears down quickly. This is an area where you want to find an excellent medium. Pay attention to the frame of the chair and make sure everything looks sturdy. Be sure that the chair does not creak and groan when you put your weight on it. You want it to rise and fall smoothly and easily with your weight on it, so if you are putting too much pressure on it, you can burn out the motor. All in all, you want a chair that is comfortable enough for the user to spend time in but you also want to make sure it will hold up as you spend more and more time in it. Especially for seniors who are aging in place, it’s important to make purchasing decisions that you know will last you a long time so you don’t need to worry about it later when you may have less mobility or time to pick out products. The size of the chair is incredibly important because if something does not fit you properly, it will not be comfortable. Furthermore, it can be dangerous for a senior to have to struggle getting in and out of a chair. If a chair is too small, you could be placing too much stress on your arms, and if it is too large you could also be struggling to move your lower body out of the chair. As you’re looking at lift chairs, it’s important to consider the dimensions of the chair to make sure that they make sense for you and your size. A lift chair can be one of the first products you buy when beginning to age in place inside your home. As a senior, resting and maintaining your comfort are some of the most important things to pay attention to as you age. With a lift chair, you can watch TV, read, nap, and relax while knowing that you’ll always be able to get in and out of your chair easily without help. A lift chair can also provide you specific position that optimize your blood flow, so you don’t have to worry about further complications that arise from sitting for too long. Regardless of your size, mobility, or ability, there’s a lift chair for you on the market. Consult with a loved one and find the perfect option to keep in your home for years to come.